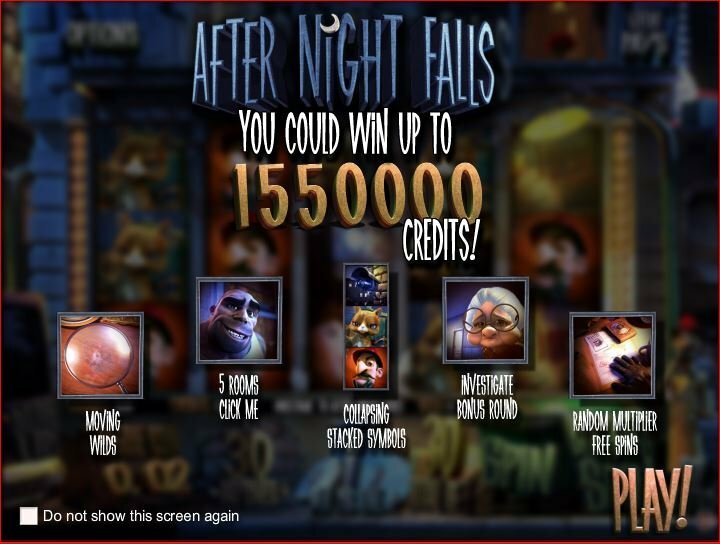 Betsoft Gaming software is here to impress again with its all new online 3D slot machine ‘After Night Falls’. 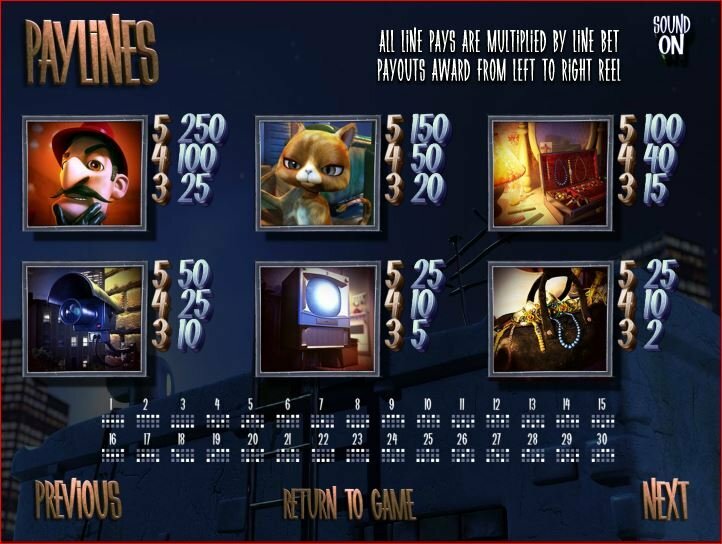 This new slot machine lets you out to catch criminals in the night with our own investigator who’s planted himself outside a nice old woman’s apartment to catch the thief who wants to steal her jewelry. 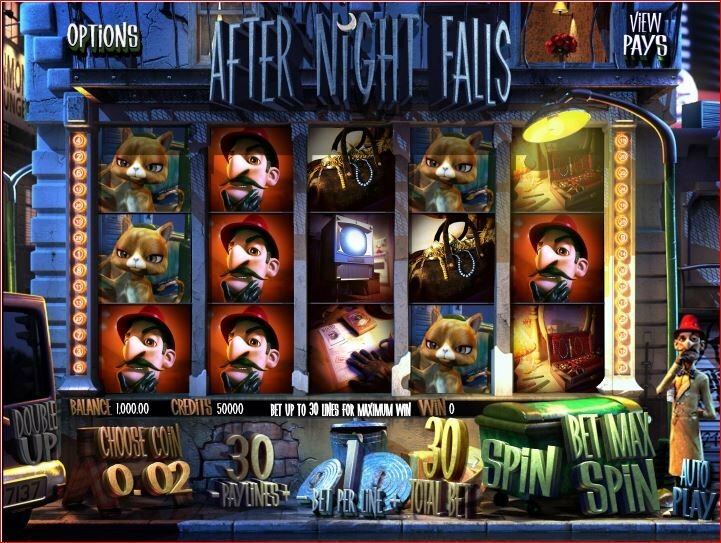 After Night Falls slot software implements the stunning graphics and overall gaming quality of Betsoft’s popular 3D slot line to provide yet another significant mark for gaming enjoyment. The supreme quality of After Night Falls video slot means that with the help of 3D technology and a creative mind, casino gaming has ceased to become a simple way to hope for a big win. It’s become so sophisticated in Betsoft’s 3D slots that I feel safe and comfortable calling what they do an art. It’s not only the visual clarity that makes me so excited for these games, it’s the clever animations that make you feel like you’re watching a movie. It’s not only the visual clarity that makes me so excited for these games, it’s the clever animations that make you feel like you’re watching a movie. In this slot, the detective stands in the alley below Grandma’s building. Every so often he’ll pull out his magnifying glass and check the dumpster for clues or pet the ginger alley cat that occasionally leaps from behind an additional trash bin. On the opposite side of the screen, the buff criminal character makes occasional appearances but as soon as he sees that the investigator is keeping diligent watch, he finds a way to dash out of sight. As all this is going on, Grandma can also be seen walking past her windows above. I’ve gotten so excited from the graphical quality that I’ve nearly forgotten the reels themselves! This game is so packed with extra features and bonuses that you’ll rarely find yourself with the lack of something new to discover. While the investigator’s desk acts as the scatter symbol setting off free spins, three pictures of the symbol activates a bonus game in which the criminal descends from the top of Grandma’s building, throws a glass bottle down the street which the investigator quickly descends upon to investigate, and you are left to help the criminal pick from several different doors to steal the biggest prize. Three Grandma symbols triggers a bonus game in which the investigator enters her apartment and you’ve got to help him pick where to search for clues. The better a clue he finds, the better you’ll be rewarded. A magnifying glass will set off free spins and a wild square that will move left from one reel to another before disappearing completely. Through all of this fun and intrigue, reels collapse when they appear with the same symbol on all lines giving you an extra opportunity to win.